The Earth Rangers Centre (ERC) is proud to be a showcase for exciting new technology as a result of a partnership between Cisco, a leader in innovation and information technology, and Schneider Electric, a leader in building technology and energy efficiency. As with any growing organization a robust, secure and energy efficient data centre is of the upmost importance. The Earth Rangers Centre uses technology to push the envelope on efficiency and this flows through the data centre, enabling our ever growing community of Earth Rangers to participate in online programs and allowing staff to work at optimum levels of productivity. Productivity, security, efficiency and integration were all addressed as part of the recent upgrade. How could we reduce the overall energy requirements of our IT needs while increasing our ability to produce interactive content and extend the functionality of our network and our building? Below we walk you through the amazing benefits to this new technology. We use TelePresence at the ERC for collaborating and staying connected with our partners. Recently Earth Rangers and Cisco conducted a TelePresence meeting to further integrate the new unified IP phone system with the ERC Building Automation System (BAS). If it were not for the ease of TelePresence, the meeting would have been extremely hard since Cisco staff were providing information and wanted to share the information on their screen with our staff. Because TelePresence allows for screen sharing, both sides were able to see and follow what was happening, and hours of commuting time was saved for both parties. Jabber is an interactive instant messaging and conference application that is added to your work desktop, phone or tablet allowing you to take meetings where ever you go. 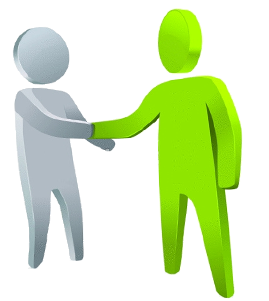 Jabber allows you to individually message one client or have a group meeting with multiple clients. In Jabber, with the touch of a button the conference can be transferred to Cisco WebEx so staff to work from any location in the building and yet stay connected. The security infrastructure upgrade included both the web and email servers resulting in increased security for the Earth Rangers online world. The network upgrade included upgrading the controller and increasing the access points allowing for a higher bandwidth and for multiple devices such as laptops, tablets and cell phones to be connected to our system while still remaining secure and safe. We knew that the data centre consumed a large percentage of our total energy demand and we were determined to decrease energy use in this area. The new technology provides a variety of solutions, both inside and outside the box. • Higher rates of virtualization using Cisco UCS 5100 server blades mean better and more flexible IT architecture while reducing total cost. • A cooling retrofit planned for completion this summer, will integrate Schneider’s APC in rack cooling with our geothermal system. We will free cool with the ground reducing our DC’s cooling energy requirements by over 50%. • The server infrastructure upgrade included the virtualization of physical servers; 65 physical servers were converted to 4 physicals servers with 65 virtual servers eliminating almost 90% of the hardware and 85% of energy costs of a conventional data centre. Using Cisco High density rack mount server, a server meant for performance and expandability over a wide range of storage, will serve us well as we grow. • New Power over Ethernet (POE) switches support wired and wireless access to devices on site as well as personal devices delivering up to 928 Giga bits per second bandwidth. The switches also allow us to centralize all of our building systems, making the ERC a smart and connected building. • The new and durable design of the Cisco unified IP phone made it possible for Earth Rangers to switch our traditional PC’s for the new desk phone and monitor systems. This integration decreases the amount of energy used while increasing data security. The use of phones as the new PC’s also makes it possible for the building automation system to easily determine when and where energy is being used resulting in better operation and energy efficiency. 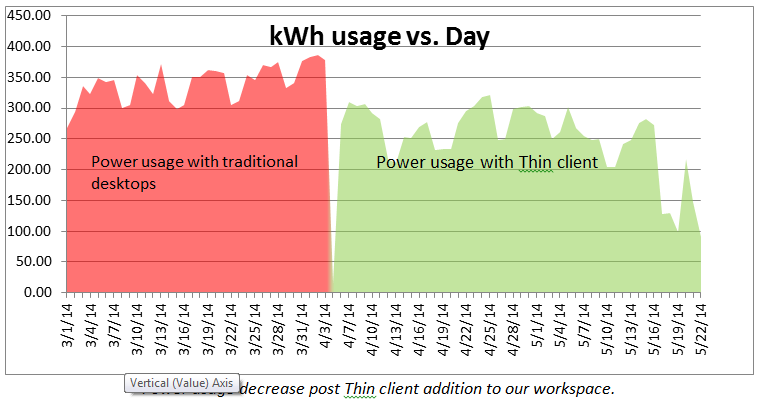 As you can see in Figure 1; post installation on April 3 there is a visible decrease in energy usage. With the preliminary data extracted from the Schneider Electric energy management system we expect to maintain at least a 26% desk load reduction and a total IT load reduction of over 13%. The Earth Rangers Integrated Control Application (E.R.I.C.A.) is a web based application used to integrate the users/occupants with their working environment. Developed in house at Earth Rangers and based on underlying technology included in Schneider Electric’s StruxureWare, E.R.I.C.A provides better management and control of building systems by allowing the user to interact with their area controls and the organizations support staff from their smart phones, tablets or workstation. The system is smart enough to know when and where the building is occupied allowing for the dynamic use of building resources and reducing wasteful use. We are currently working on pushing it another step further by taking it to the IP phones. We have already determined E.R.I.C.A will run on the new Cisco unified IP phones we just need to see how far we can take it. Can we connect to the peripheral devices such as Bluetooth enabled headsets? Will we use the activity associated to the work stations as occupancy detection or even normalize our energy use to workstation productivity? We believe that integrated solutions and our partnerships with Cisco and Schneider will help us answer these questions and continue to increase productivity while also lowering our energy usage as we strive for net-zero energy status.